I went into the garden to see what kinds of veggies and herbs I had. Luckily I had 6 gorgeous tomatoes, a ton of small red peppers, and some fresh basil, thyme and oregano. So those were definitely going into the dip. Then I headed to Sam’s Club to pick up all of the items we needed for the party. 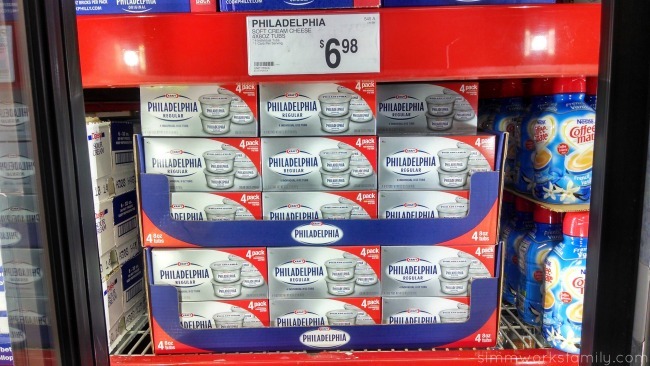 While at Sam’s Club I grabbed a 4-pack of Philadelphia cream cheese. I was excited to see that they recently upgraded their 3-pack to this 4-pack. 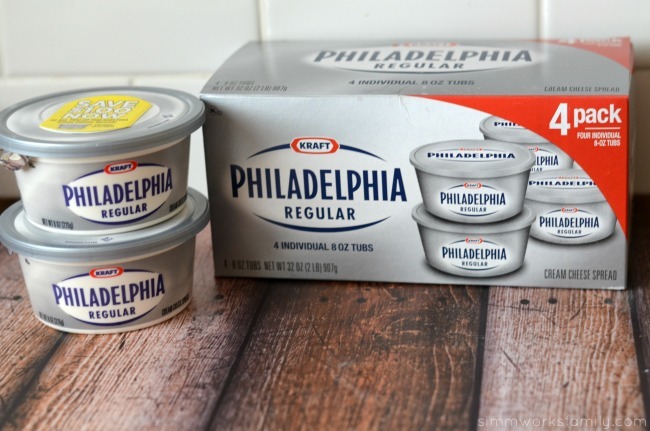 While it’s the same amount of cream cheese, a smaller volume in each tub means I don’t have to worry about using up all of the tub before it expires. I also grabbed the veggies, salad, and cupcakes we were going to serve at the party. Once I checked out it was time to get home and start the party prep. 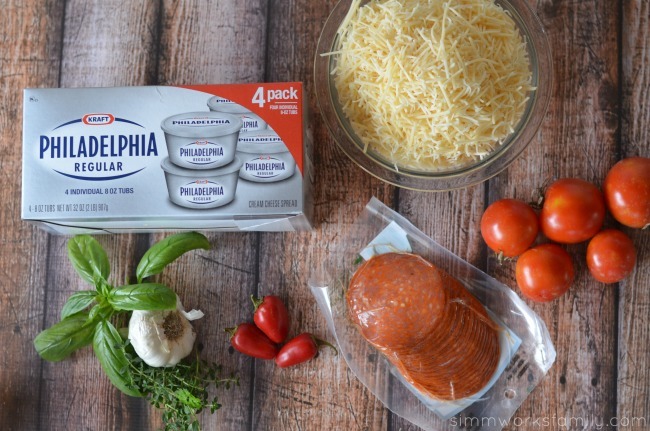 Having Philadelphia cream cheese on hand is perfect for my holiday baking and cooking! I love incorporating cream cheese in my sugar cookies, buffalo chicken dip, and a few other favorite recipes. Planning ahead is always my number one guarantee for success when it comes to party planning. And that includes making anything I can for a party the day or night before a must. Dips, casseroles, veggie prep, etc is all done the night before. And so was this dip. It can be refrigerated overnight and then taken out when you need to heat it up before guests arrive. If you don’t have time to roast your veggies ahead of time, don’t fret! I’ve also made this dip with jarred sun dried tomatoes and jarred roasted red bell peppers before and it’s tasted equally delicious. But since I already had both veggies on hand from the garden I went that route. Preheat oven to 425 degrees. Slice tomatoes, de-seed peppers, and peel garlic cloves. 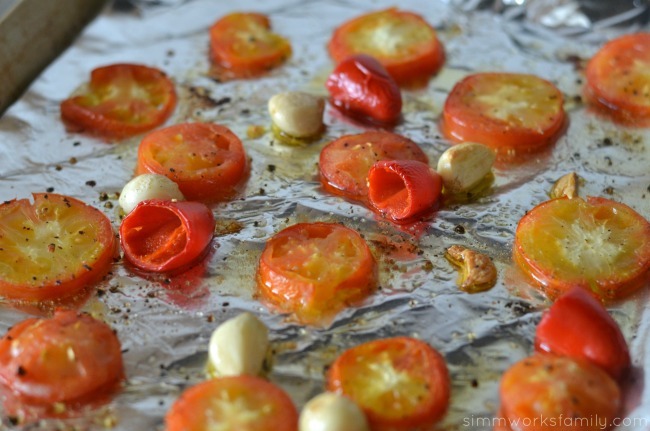 Toss in olive oil and spread over a rimmed cookie sheet lined with foil. Roast in the oven for 20-25 minutes. Let cool. 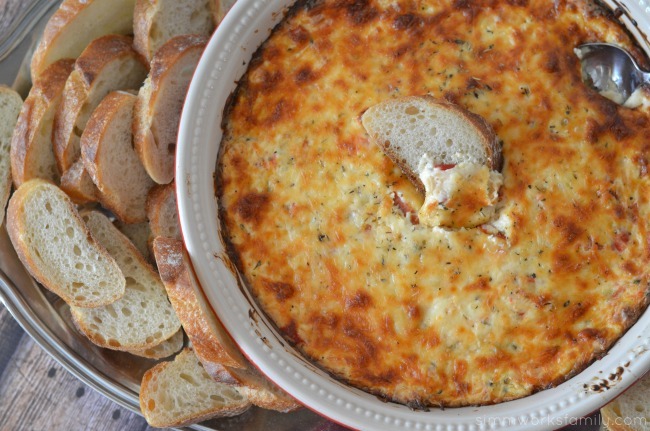 While veggies are cooling, in a large bowl mix together two cheese blends. 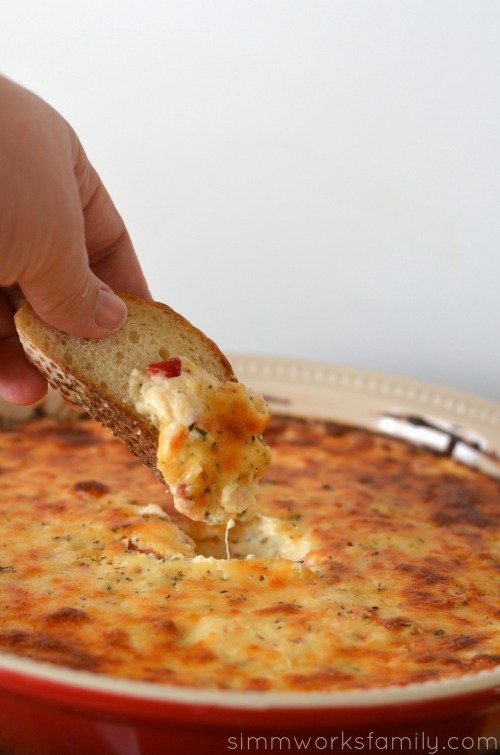 Set a handful of cheese aside for topping. Add salt, pepper, spices, pepperonis, and cream cheese to the bowl and mix well. Once veggies and garlic are cool, dice up veggies and mince the roasted garlic. Add to the cheese mixture and stir in well. Place dip into a pie pan and spread evenly into the pan. Add the reserved cheese to the top of the dip and sprinkle with Italian seasoning. Bake dip in oven at 375 degrees for 30 minutes or until top is browned and bubbly. Serve hot with a delicious sliced baguette or crackers. 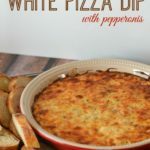 The dip was a huge hit at my party and is sure to make a repeat appearance at our Christmas dinner. 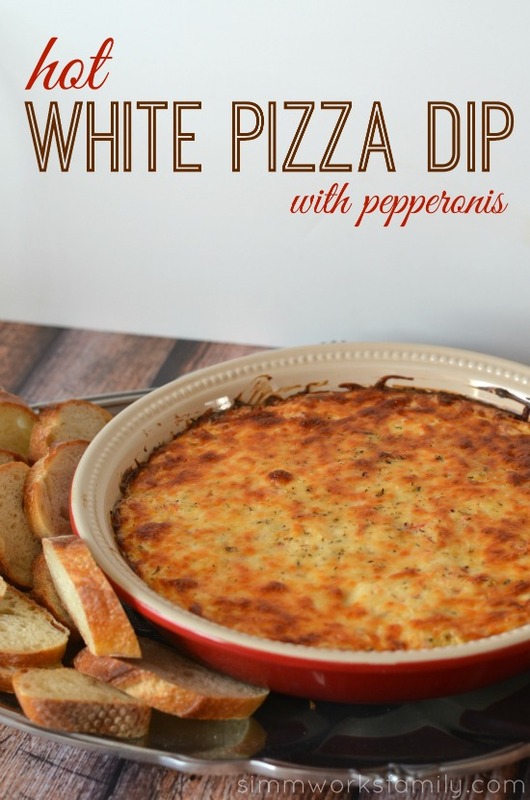 I love finger foods with amazing dips like this. That looks delicious! I think my kids would totally love this too! That looks so good!! Yum! Good job! This looks delicious. I am also slightly jealous that you have veggies in your garden still. It is single digit temps here with snow due to fall later today. The fresh veggies look amazing with the Philadelphia cream cheese. You have me so hungry right now and it’s only 10:30. I have a couple hours to wait until lunch! This looks so good! I know the kids will love it also. Pizza is always a hit with them. I can’t wait to try this recipe. Thanks! Oh what a fab recipe! I will have to try making this for sure. Thank you :)I’ll be sharing on Pinterest too! I cannot wait to try this! This sounds so delicious! Oh my… This just looks amazing! Must try this soon… Thanks for the recipe! My mouth is watering! I am heading to the store later and am definitely grabbing stuff to make this. My family is going to love it! I think your dip is going to be my NEW favorite party food. Yum alert!! I can’t wait to try this – cream cheese makes everything great! Wow. This looks SO AMAZING!! I cannot wait to try this!! Thanks for the awesome recipe! I”m afraid if I made this, Alan might disown me.